John Joseph Adams dedicates this volume to Jim Starlin, Ron Marz, and Ron Lim. I didn’t notice this dedication until after I had read the book, and yet the connections I had made between Adams’s collection and my own touchstone comics turned out to be eerily fitting. I had remembered, for instance, reading The Infinity Gauntlet for the first time in trade paperback. About halfway through that came the conflict with which I had thought the story would climax—the final, desperate assault of the collected Marvel heroes against Thanos. Then I turned the page and was confronted with the realization that the writers and artists of this comic were taking things to an entirely new level. All my puny, mortal human heroes had been only a distraction to keep Thanos from noticing the impending onslaught of Marvel’s array of cosmic deities. And then that vast, sprawling battle broke over the panels in swirls of energy that almost bled off the pages. I had similar experiences with the DC universe, in the space operas of the Green Lantern Corps long before Geoff Johns’s famous run. I even found something similar in the comic book version of The Transformers, as Simon Furman took the planet-sized villain from the animated feature film and spun out an epic backstory stretching back to the birth of the universe. In all of these comics, there was a sense of sweeping cosmic myth, of fantasy on a galactic scale. They were held together with a very thin veneer of science fiction, but they worked as a new kind of mythology. Starlin, Marz, and Lim, of course worked on classic runs of Adam Warlock and Silver Surfer (both of whom featured in The Infinity Gauntlet), as well as DC’s Green Lantern. It’s the sense of cosmic myth which characterised the work of those and other writers that John Joseph Adams is trying to capture in his latest anthology. As Adams explains in the introduction, he’s after, in the stories he’s assembled for this book (which, to be clear, are accompanied by no art or illustration other than on the cover), the wonder and scale of those full-page comic spreads of my youth. With those comic book inspirations in mind, are the stories here true science fiction or are they something pulpier? The volume is on first glance a standard science fiction anthology of short stories. I would argue, however, it’s actually something distinct, something I would instead label science fantasy. It’s a distinction that might be a fine line in fiction but one which becomes important, for example, in movies. In my astronomy classes, I often give my students an opportunity to write a review of a science fiction movie and critique its scientific content. In this case, I want to steer them toward hard SF and away from science fantasy. Many students don’t understand the distinction, so I explain that science fiction treats the science (regardless of how advanced) seriously and as a major component in the plot or story universe. Science fantasy, on the other hand, feels a lot more like the cosmic myth of those Silver Age comics. It’s fantasy set against a cosmic background in which “science” (usually magic with a technological flavor) is little more than a prop for the setting. This definition lets me rule out films like Star Wars or Guardians of the Galaxy as movies to dissect in a report. The distinction is harder to make on the page than it is on the screen. On the page it’s much easier to add a few lines of exposition gesturing at the science behind the magic, to give it a veneer of SF feasibility. A sentence or two about uploading consciousness, for instance, can blend the line between magical possession and technological wonder. Movies are less likely to have the space (or need) for this kind of exposition. But it’s still a useful category for discussing Cosmic Powers. The stories in this anthology that really work, that keep the volume from being “just another” science fiction anthology, are those that eschew science fiction conventions for things stranger and less tightly constrained by physical reality or the techy realism of SF tropes. 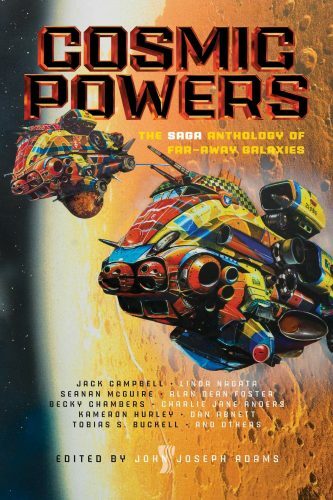 The stories in this anthology are indeed told against a galactic backdrop, and in this respect Cosmic Powers is reminiscent of an earlier Adams anthology, Federations (2009). But whereas Federations was more straightlaced, making one think of the clean-cut crew of a Federation starship, Cosmic Powers when it really works is more fun, less formal, with a style on the page something similar to the one with which The Fifth Element or Valerian and the City of a Thousand Planets played on screen. From there it only gets stranger. The story is not a joke, though the main character’s name is Sharon and her ship is called the Spicy Meatball. The weirdness and the plethora of oddities don’t let up throughout the piece, but they’re what makes the story epic. There’s a giant brain in space, a sentient superweapon, a pair of space pirates trying to pull off a heist, and a pleasure planet complete with carnivorous prostitutes. Anders’s story gives the gist of what is to follow, a sort of microcosm for the rest of the book. The tone is set: fast-paced fiction on a huge scale, and with vistas of explosions, colors, and bizarre lifeforms. It’s as much fun as you expect it to be. “Infinite Love Engine” by Joseph Allen Hill is another excellent example, a story that feels like an off-the-cuff riff on the cartoon Adventure Time—if the latter were set in space. Everything is bigger than big. Aria is trying to prevent a sort of love parasite from taking over the universe by going on a quest across the flesh of a dead god. Along the way, she has to have an existential debate to the death with a robot on the nature of love and free will. Yet for all the ridiculous tone and content, it lands with surprising emotional heft. Similarly, another highlight was “Unfamiliar Gods,” by Adam-Troy Castro, with Judi B. Castro. This one takes place in a universe that is what Star Trek would have been if warp cores were replaced by sacrificial rituals to cosmic deities. If it were the power of gods, not technology, that allowed space travel, what would galactic warfare look like? One ship suddenly finds itself alone and at the mercy of a new, unfathomable deity, and suddenly all those Star Trek episodes featuring Q take on a sinister shade that they probably always should have had. In fact, in this work the stories that seem lightest, that seem to be taking themselves the least seriously, apparently playing very fast and very loose with the science and ramping up the absurdity, are the ones that end up doing the heaviest lifting. Not every story succeeds in this way, however, and if you prefer your science fiction to take itself more seriously you might have some frustrations with this collection. Within its context, I thought the ones that tried to carry more weight and addressed more self-consciously themes of loss and remorse, such as “Tomorrow When We See the Sun” by A. Merc Rustad or “The Dragon That Flew Out of the Sun” by Aliette de Bodard, were fantastic stories but had an emotional center of gravity at odds with the rest of the anthology that took them out of the orbit of the other pieces. Indeed, though I would classify most of the stories collected here as science fantasy, there were some pieces that played with harder science and bared technological teeth. “Golden Ring” by Karl Schroeder is one example: a godlike AI visits a frozen planet that was once being thawed by planetary engineering with huge solar mirrors; it finds survivors of a society who are able to participate in galactic civilization by locking their hibernation cycles into a specific pattern. By timing periods of wakefulness to the travel times between planets, these individuals can get around the FTL barrier and create the illusion of instantaneous transport. Schroeder’s story also plays with the idea of cosmological data regarding the impact of the cyclical nature of the universe on the ethical decisions of human beings. These were hard connections to follow in the story, with their implications for free will and the infinite nature of time, but the story again harkened toward the immensely large scale which characterizes all these tales. All this concludes with “The Frost Giant’s Data” by Dan Abnett, a laser-focused heist story that rounded out the anthology with some crunchy tactical action. Abnett thrives here with short, staccato combat sequences made all the more jarring by the narrator jumping his consciousness between various cloned host bodies, each one of them messily eliminated during an assault on a Kuiper-belt object that has been transformed into a data-storage fortress. It’s a quick, satisfying piece that ends the collection like a well placed judo-chop. The timing of this volume, with the impending release of Marvel’s cinematic interpretation of Infinity War, is propitious. As these cosmic battles begin to be realized on the big screen, Adams’s editorial work in Cosmic Powers can be seen as a tribute—and an explicit link—to those original comic book inspirations. In this way, he has delivered an anthology that won’t necessarily transform the field or even a reader’s perceptions thereof but rather do something almost as hard: maintain a gripping pace and sense of the new and bizarre throughout. As far as Adams’s intention, to revisit the feeling of those early cosmic myths of those Silver Age comics and make them come alive (in prose) for a new (or a nostalgic) generation of readers? Well, in this he certainly succeeds.